Traditionally reared, pedigree Ryeland lamb as half lambs. Typically, a butchered half lamb weighs about 8kg and costs £13 per kg. Each box contains a mixture of joints, chops, mince and optionally sausage and burgers. Our lamb is grass-fed, slow matured and extremely tasty. Read more about our Ryeland lamb. 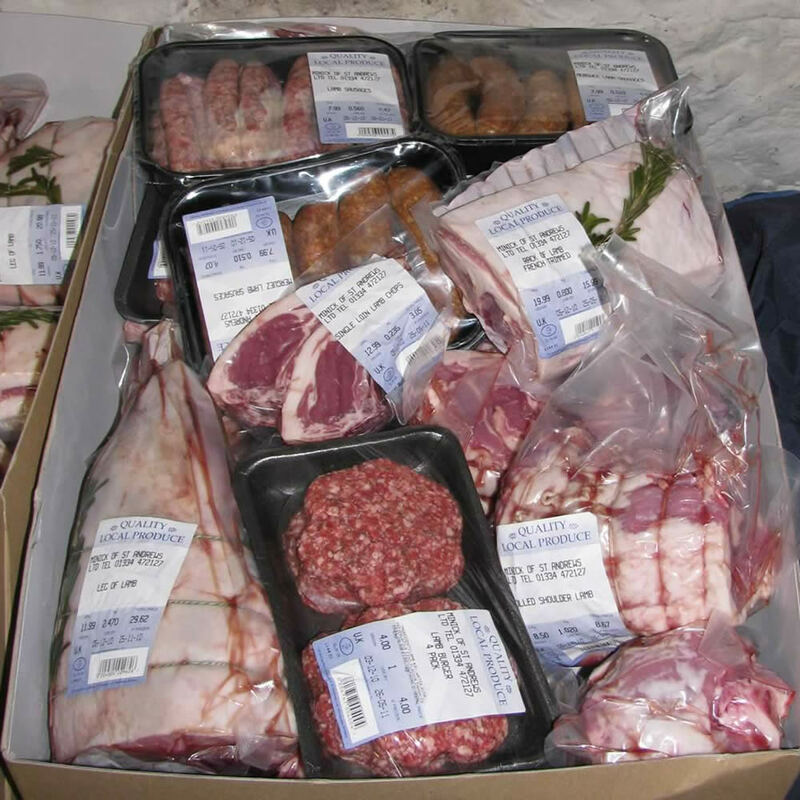 Boxes are sold around October/November – £30 deposit secures a half lamb. NB: Boxes can only be collected from Dalmore. We sell traditionally reared, pedigree Ryeland lamb as either whole or half lambs. Typically, a butchered half lamb weighs about 8kg. Our lamb is professionally butchered, vacuum packed and delivered ready to freeze. A half lamb requires very little freezer space – once jointed and packed, it will fill one drawer of an average domestic upright freezer. We breed our own lambs here at Dalmore. They are Coloured Ryelands, a traditional British breed originally from the area around Hereford. The Ryeland is one of the oldest recognized breeds of sheep, having been developed by the monasteries to graze the rye pasturelands, hence the name. Born in early April, our lambs graze our herby pastures for a full six months. In the autumn, we take them to Downfield Farm abattoir in Cupar; the carcasses are then delivered to Stuart Minick, Butchers, at Ladybank to be hung for a minimum of 7 days before being butchered. Then it’s over to you! The meat will be presented as a selection of joints, chops, dice and mince. If you have any special requirements please let us know and we’ll tell the butcher. Scrag end (bone in) – for traditional Lancashire Hotpot! Lamb mince – for burgers, moussaka and Shepherd’s Pie or this can be made into sausages, perfect for the barbeque. This year’s lamb price is £13/kg. We ask for a deposit (non-refundable) of £30 per half lamb, payable at time of ordering. This will be deducted from the final invoice. The balance will be payable when you collect your lamb pack from us. We will also have lamb and mint burgers and lamb sausages (herby, merguez and jalfrezi) to add to your box if you wish. Four 1/4lb lamb and mint burgers will be £4.50 and lamb sausages – herb, jalfrezi or mergeuz – will be £9/kg (while stocks last).